Where does RECS square footage data come from? The size of a home is a fixed characteristic strongly associated with the amount of energy consumed within it, particularly for space heating, air conditioning, lighting, and other appliances. As a part of the Residential Energy Consumption Survey (RECS), trained interviewers measure the square footage of each housing unit. RECS square footage data allow comparison of homes with varying characteristics. In-person measurements are vital because many alternate data sources, including property tax records, real estate listings, and, respondent estimates use varying definitions and under-estimate square footage as defined for the purposes of evaluating residential energy consumption. What areas are included in RECS square footage? In RECS, total square footage is a measurement of the two-dimensional area of the housing unit that is enclosed from the weather, including exterior walls. This is also the area where residential energy-consuming activities occur. Total square footage consists of four areas: attic, basement, garage, and rest of home. These four areas are separately measured by the interviewer because each may have its own heating and cooling characteristics. 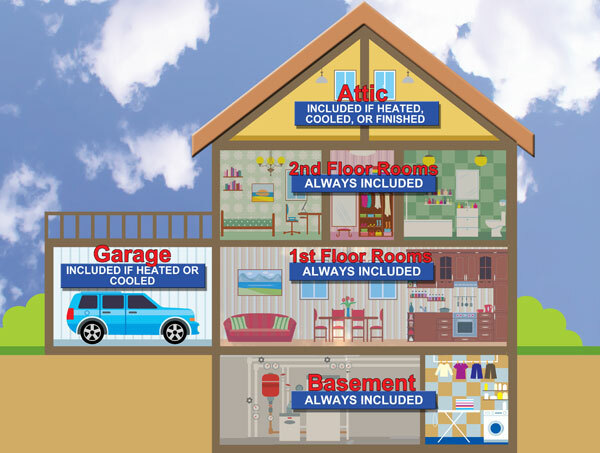 Attics are only measured if they are heated, cooled, or finished. Garages are only measured if they are heated or cooled, and directly attached to the housing unit. Trained interviewers use a standardized method for measuring and collecting the dimensions of the housing unit. RECS housing units are measured during the in-person household interview. The respondent reports the number of stories in the housing unit, characteristics of the basement, attic, or garage, and the shape of each floor. Then the interviewer uses a measuring tape to collect the dimensions of each floor of the housing unit. Ideally, measurements are taken outside the housing unit to capture the total area of the home. Where outside measurements are not possible (for example, a high-rise apartment building), inside measurements are taken and adjusted for wall thickness after the interview. For standard shaped floors (square, rectangle, T-, or L-shaped), the dimensions are recorded as part of the questionnaire on the interviewer's laptop. For floors with non-standard shapes, the interviewer sketches the shape on graph paper and records the necessary dimensions on the sketch. How are RECS square footage variables calculated? Using the dimensions and sketches collected during the interview, a number of square footage components are calculated, including each floor's area; attic, basement, and garage areas where applicable; and heated and cooled spaces. Analysts later reviewed unexpected or unusual values, as well as interviewer comments. When appropriate, dimensions were corrected to accurately reflect the size and shape of the housing unit. Missing measurement data is imputed. EIA uses a statistical process called hot-deck imputation, where a case with missing data is randomly assigned the same data value as a similar case. Characteristics such as housing unit type, number of stories, and number of rooms are used to locate donors in the same "statistical neighborhood". Due to a variety of factors, RECS square footage estimates may not be appropriate for comparison with other data sources. Most other surveys, including the American Housing Survey, rely on respondent estimates of a housing unit's size. Property tax records and real estate listings often rely on in-person measurements, but included areas differ by jurisdiction and housing unit type. Analysis conducted by EIA suggests alternate data sources and respondent estimates of square footage are typically much smaller than RECS measurements. For example, unfinished basements are not commonly included in measurements used for property tax assessments. Unfinished basements are an important part of RECS square footage because they often contain major conditioning equipment and/or ductwork; thus, the area contributes to the housing unit's energy consumption and intensity. Most respondents underestimate the size of their home as compared to the RECS measurement. The magnitude of this error is related to the housing unit type and other characteristics of the home, including the presence of basement, attic, and garage areas.